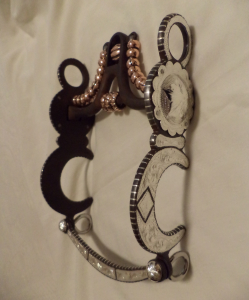 This section has mainly some of the Argentine Snaffles, Gag Snaffles and bits made with a snaffle mouthpiece. 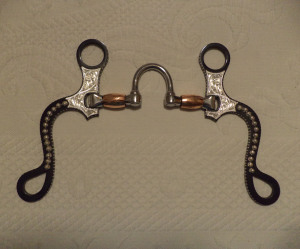 If you are looking for a Loose Ring or D Ring Snaffle go to snaffles main category. 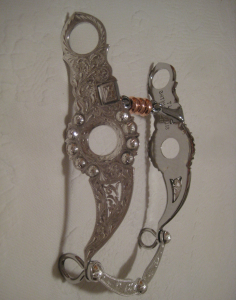 We have a wide selection of custom silver show bits (over 260 bits) so that you can find a pair suitable for you. 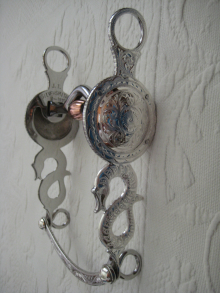 Customize your handmade silver horse bit per the options available in the drop menus. 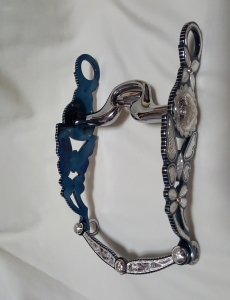 By using the drop menus, you can request pretty much any change you feel necessary to make the custom western horse bit suitable for you or that special love one you want to surprise. You can choose the style of cheek piece, the mouthpiece (MP), MP width and angle that you prefer. 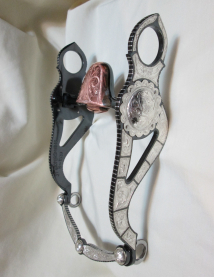 We can create or customize the handmade silver show horse bit per your specifications. 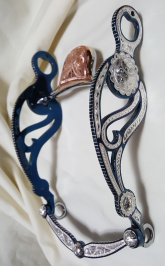 We specialize in custom manufacturing, we can create, build to replicate your design or customize the item to your satisfaction so send us your sketch with all the details of how you want your custom horse bit made -- we'll gladly give you a price quote and delivery time. For example: Cheek piece of B-1580 with the concho of B-1547 for a beautiful bit. The price will vary depending on the size of the concho. Our bits are available with 88 different mouthpieces MP-01 thru MP-88. You can type the mouthpiece number (without spaces) in the search box at the top right corner of the screen (example: MOUTHPIECE10) so you can see what the Mouthpiece looks like. 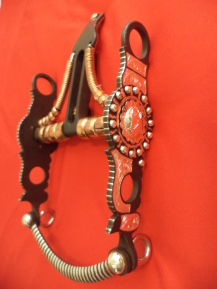 In this section we have put bits made in the past grouped by these styles: Argentine snaffles, Arizona cheeks, Big Concho, Calvary pattern shank, Charras, Chileno Ring Bit, Gag Snaffles, Las Cruces, Nevada, Number 7, Rod Iron Cheek, Santa Barbara, Santa Lucia, Santa Paula, Santa Susanna, Sonora, Spade bits, and U.S. Style. 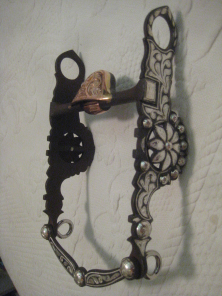 For the rider who is looking for Back boned (de Espinazo), Chevron stripes, Crescent Moon, Daisy Concho, Filigree, Hearts, Horse shoe, Pistol Bits, Round, Snake , Special Bits, special Projects, Star, Trophy (ideal for personalizing), Wagon Wheel. If you can't find the handmade silver show bit you are looking for, please call us toll free at 877 587-4583 or direct at 209 492-0114. You can also email us at sales@jtsilversmiths.com or use the "remarks" section to let us know of any changes or specific measurements you need. 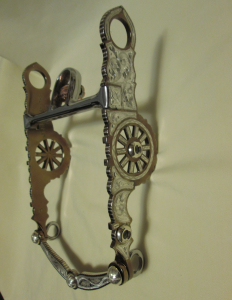 The iron in your custom western show bit will oxidize eventually creating an attractive contrast to the silver. Moisture and humidity will expedite the oxidation. So keep your handmade bit dry to retard the oxidation. Choose Sterling over Stainless if you don't want them to rust. The silver will tarnish but will give the engraving a nice contrast making them look antique. There is a wide selection of custom silver show bits and countless options/changes that can be made to your handmade bit. Most without additional cost. However, if putting a larger concho, the price goes up depending on the size of the silver concho; and custom bits with a brand or initials in Jewelers Bronze are approximately $30 more. The mouthpiece is included when purchasing a bit. However, a handful of mouthpieces, mainly the spade and those with more work or copper, are $25 extra; the Chileno MP-25R is $35 extra. 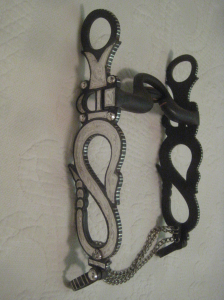 The custom, handmade bits are available in STERLING OVER STAINLESS (which is Sterling Overlay - all White in color – See B-1020 SOS); and Steel with a BLUED, BLACK, BROWN or PATINA finish (Sterling inlay – see B-1020 Silver Inlay, Blued) for the same price -- as noted in the drop menus. If you want the Steel with a Blued, Black, Brown or Patina finish with sterling overlay (see B-1020 Silver Overlay, Blued), it may be same price or slightly higher. If you don't see the horse bits or options you are looking for, please call us at 1 877 JTSilver (587-4583) or e-mail us at sales@JTSilversmiths.com.